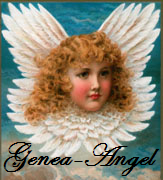 Susan at Long Lost Relatives created a Genea Angel Award and I have been a recent recipient of it. Thank you to Barbara at Life from the Roots for giving me this award. According to the Long Lost Relatives blog, the Genea Angel Award is "a simple way of paying it forward - to recognize those people who have aided in your research, provided insight or otherwise given you inspiration and guidance in your family history journey. The recipient of the Genea-Angel award may display the image on their blog or web site if they choose." I received the Genea Angel award a few days ago and have been giving thoughtful consideration as to how to pay it forward. There are so many wonderful, generous genealogists and narrowing the list is hard. I have chosen two to pass it on too. First, is Apple of Apple's Tree-not only is she a 'Glover' cousin; but she has shared information about the 'Glover' line with me. Plus, she introduced me to another 'Glover' cousin that I wrote about meeting last week. So, Apple I hear by award you the Genea Angel Award. 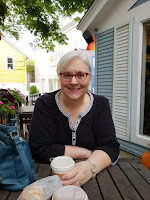 Next, is Lisa at The Faces of My Family blog-Lisa was the first one to choose my blog as a "Follow Friday" selection. I was so honored and surprised. Lisa is supportive with comments to other bloggers and I feel she deserves the honor of being a Genea Angel. Many genealogists pay it forward so often and I hope to see many "Genea Angel's" awarded and gracing blogs soon. Thanks, again Barbara for recognizing me as a Genea Angel. Thank you very much! You are the first cousin I've found through blogging that I'm not connected to through the Salem Witch trials and I'm thrilled that I have someone else that I'm related to. I love to see your Glover posts because they are about people I "know"! Apple, I am glad we connected, too. I feel the same way when I see your Glover posts.